The Cork Ball-Shells were designed to work with a natural cork ball that was original used all the way back to thimble rigging and then the walnut shells. The master magician that was known for working the shell game with walnut shells and a cork ball was Jack Chanin. Most recognize Jack Chanin for the Chanin Dip that has been employed into the modern day classic type shells as a gimmick with the use of a soft pea. Jack Chanin did not use this dip gimmick or have it on the shells he sold. 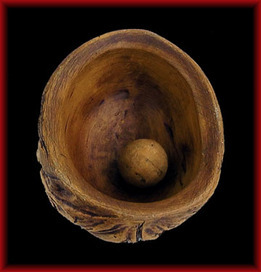 Jack designed the Chanin dip for a friend to made it easier for him to use the shells with a cork ball and later the gimmick was employed by others to make the game easier to do. The employed shell gimmicks require very little sleight of hand skills, as they are more of a self-working shell with the added gimmicks. This is why they never can be examined. Jack Chanin was a master at the shell game and didn't need to rely on a gimmick shell. His shells had an entire flat surface without any dip or inverted V notch. His shells came with a cork block and instructions on how to carve the cork into working cork balls. Jack was also an intelligent entertainer that knew there was a difference between displaying the shell game for entertainment or playing for money. The expected rules of the game are not the same. He just had real entertaining skills. 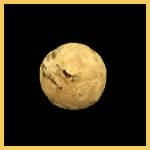 The Cork Ball-Walnut Shells; are molded from a real walnut shell from the inside and out. There are no gimmicks employed into the shell. The interior of the shell is designed for the cork ball to roll freely inside the shell without coming out of the shell when moved in all directions on the surface. The shells appear to be fair shells and they are. But at any time you choose to make a steal and load into another shell it can be executed in an undetected way. The same handling that is used with our Bottom Ridge Shells works very well with these shells. So if you know this handling you have a head start in mastering these type shells. Basically, these type shells bring all the features the bottom ridge shells bring, but is all done without the added ridge and is all done with a natural cork ball. Unlike other shells, these shells do have an undetectable secret to how they work that will only be known to the ones that own them. They can be fully examined at any time without switching anything out. These shells are not hard to use with some basic sleight of hand skills like; the finger clip, back finger clip, and the thumb clip. The cork balls are easy to finger clip. ﻿Features that the Cork Ball brings :﻿ With the use of a cork ball with your shells it will look more natural. 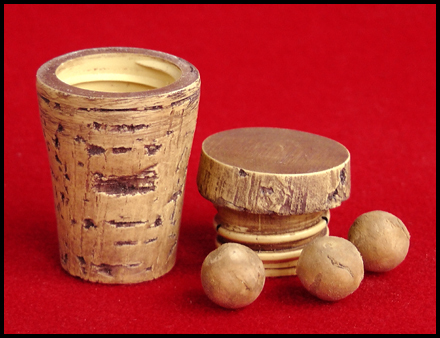 A cork ball being used will work like the player thinks it should work, to have a chance to win. The best part is this can all be shown very openly without switching anything. This can bring the confidence that they do have a chance. With the shell interior design for the cork ball, the ball will roll freely inside the shell without coming out of the shell. Also will not bring any sound from hitting the shell walls. This is perfect to what you want them to believe on how everything works. They can even handle everything before the game starts to even bring more confidence to play, as you don't have to hide anything from them. All of the equipment being used has no gimmicks. The secret is the handling! These shells are not a self-working set of shells like other shells. They are as good as you are, because you have full control of everything and nothing to hide. The shells can also work with a soft pea if preferred, but using a soft pea will take away some of the fair game features. ﻿﻿These shells are recommended for the serious shell workers. Video handling instructions are included with the purchase of the shell set. These shells are called "Grizzly Shells" because they're big, strong and can get a grizzly grip on the shell. The inside of the shell design brings the features when working with a nature cork ball you will have full control of the ball. The cork ball will stay inside the shell when moved in all directions on the surface. This makes the shells fair shells in selling the con and can be fully examined at any time. But at any time you choose to make a steal and load into another shell it can be executed in an undetected way. The same handling that is used with our Bottom Ridge Shells works very well with these shells. So if you know this handling you have a head start in mastering these type shells. Basically, these type shells bring all the features the bottom ridge shells bring, but is all done without the added ridge and is all done with a natural cork ball. If you like to do the shell display with all three shells in one hand, you will find these shells are very amazing for this. Most large shells you will have a hard time fitting three shells between your fingers. These shells are 2-1/8 long by 1-1/2 wide and 1 High, one of the largest shells made today. If you look at the picture above it shows the back of the three shells. You can see just above the bottom shell base the natural shape of the shell goes inward some, where the side of the fingertips can fit perfect to hold and control the shells. You have full control of all three shells independently at the same time the ball stays inside the shell when the shells are moved. When all three shells are shuffled on the surface the hand can lift the shells up and down during the shuffle, to show the cork location. This will convince them to follow the right shell. When you decide to do an undetected steal and a load into another shell, it is only once and only when you choose too. This will all show that you have some good sleight of hand skills. The shells can also work with a soft pea if preferred and will work with all standard handling, but using a soft pea will take away some of the fair game controlled features. All of the equipment being used has no gimmicks. The secret is the handling! ﻿﻿This shell set is beautiful with the vintage look to bring out the wonderful grain of the shells. The pictures don't do them justice. The molds were made from a real walnut shell that came from a very unique tree that produces large walnuts. The shells have good height to pick them up easy. Also good height and room on the inside of the shell for the cork ball to roll freely. The cork ball will remain inside the shell when the shells are moved in all directions. This brings many features that other shells can't do. Like; can be fully examined at any time. After you steal the ball from one shell and load the ball into another shell and this shell can be moved to appear to be empty. No need for all the extra stealing and loading. They have no gimmicks and appear to be fair shells to bring a fair chance to win and they are. But at anytime you choose you have full control to make it a unfair game. You have control of every move and you are never forced to take the ball. When using a cork ball with the shells. 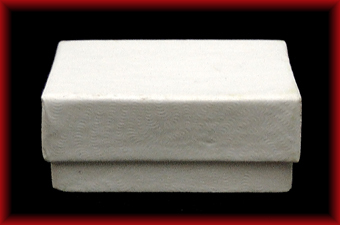 One of the most popular type shells used on the streets world wide today are the three box shells. On the streets they don't depend on gimmicks, like the Channin dip or a hole in the back of the shell for the ball to escape. It is done by sleight of hand skills. The Strong Box Shells brings the real deal for the ones that want to go further to display the real con of the three shell game. These are not like the classic type walnut shells that are a self-working type shells that anyone can do or can learn the secret to there use by just looking or moving them. The Strong Box Shells work with a 3/8" or 1/2" natural cork ball. Using a natural cork ball brings many features to sell the con. The working cork ball is sized to be very visual and always stays inside the boxes when they are shuffled around of the surface. It is like the bottom ridge type shells, but without the ridge. Like the bottom ridge shells you had full control of the ball to steal and load another shell when you want. You also have no visual clues or anything to hide, so everything can even be fully examined if need be. The sleights in using them are not hard to do, but are not a self-working set of shells. The same type handling that is used with the Bottom Ridge Shells works very good with these Box Shells. So if you have worked with the Bottom Ridge type shells you have a big head start in mastering the Strong Box shells. The boxes are made of a high impact semi-rigid white color plastic resin and the molds were made from real cardboard boxes like used on the streets. These boxes will last you a life time and can be easily cleaned. Entire flat bottom surface without any visual gimmicks. The boxes do have a hidden secret over other boxes used, but will never be known till you own a set. The size of the box is great for easy handling. There are many fancy moves you can do with the three boxes in your display. When you master these, you will know your a real shell-man! Box Bottom - 1-13/16" L X 1 - 3/16"
The cork ball container can hold your balls in a handy screw top container that looks and feels like cork. It is made of high impact plastic of the color of a cork. Comes with three 3/8" textured cork balls. 1- 1/2" high x top cap 1" diameter x container bottom 3/4"
Clip & Grip can help many magicians that have problems with holding a cork ball between the fingers. This solution is a coating that is applied on the fingers like a lotion, but is not a lotion. Most lotions can make gripping and clipping a ball with the fingers worst. This is because most have some oil base to it and can soak into the ball. There is no oil base in Clip & Grip. It puts a coating on the fingers that will dry in 30 seconds and will work for hours till you simply wash off with water. You will hardly notice it on your fingers. What you will notice is how much easier it is in doing the sleight of hand moves you always hope to do better. It comes in double wall container. Glycerin base just like fine beauty products. This product was mainly bought out for clipping a cork ball . Which is not easy for most to do. You will be surprised on how easy it will become in clipping a cork ball in a finger clip, back finger clip and a thumb clip. You can now do the shell game the way it all started with a cork ball and done easy with Clip & Grip.